Sir Alex Ferguson paid tribute to the ambition of Fleetwood Town chairman Andy Pilley as he opened their new £8m training ground. The Manchester United legend was on the Fylde coast this morning to cut the ribbon at the Poolfoot Farm camp in Thornton, watched by hundreds of guests. Sir Alex Ferguson opens the new Fleetwood Town FC training facilities at Poolfoot Farm. He is pictured with chairman Andy Pilley. Ferguson took a tour of the facility alongside Pilley and the club’s Chief Executive Steve Curwood, then stopped to tell The Gazette of his admiration of the people in charge. “I always think ambition comes from people who lead clubs,” said Ferguson who won 38 trophies in 26 years in charge at Old Trafford. “The chairman and Steve Curwood clearly have ambition to improve Fleetwood Town. “There always needs to be someone who is the driving force behind something, and that’s the case here. 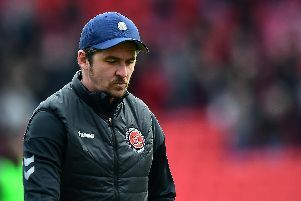 “You need people like that and that’s what they’ve got here at Fleetwood, and they are lucky. Poolfoot boasts Premier League style facilities with 12 grass pitches, two full size 4G artificial pitches, a fully fitted gym, fitness studio, physiotherapy suite, dedicated classrooms, meetings rooms, a top quality bar and restaurant, seven changing rooms and offices. And the sheer size of the complex is something which left Sir Alex hugely impressed. He said: “When I first heard about this development I assumed it would be a small academy which would be suited to a smaller club like Fleetwood. “But when you get here and you see the magnitude of it you really see the ambition of the club. “The facility has really surprised me and I think it’s really fantastic, it’s brilliant. “I always admire people with the foresight to plan to improve your situation and club. Sir Alex, 74, accepted a personal invitation from Fleetwood two months ago to open the complex, something which was kept under wraps until last week. And chairman Pilley couldn’t hide his excitement after walking the footballing legend around the building. “To have a facility like this and to have it opened by Sir Alex Ferguson, such a legend of the game, is a great honour for us all,” he said.